Nurturing your body from the inside out is easy with Pure Emu Oil gel caps. These capsules contain only emu oil, along with 5% of vitamin E to deliver a nourishing boost of antioxidants and essential Omega fatty acids throughout each complex system in your body. Essential fatty acids are critical for the proper function of your entire body, and since it does not make Omega 3 and Omega 6 on its own, supplementing with emu oil ensures that your body always has a ready supply available. Essential fatty acids have received a lot of attention in the media because of their beneficial effects on the mind and body. A recent study published in the American Journal of Clinical Nutrition specifically discusses the benefits that essential fatty acids have for reducing inflammation throughout the body, along with lowering cholesterol and improving joint pain in people who suffer from arthritis. In addition to these benefits, you can also expect to enjoy these positive health effects when you utilize the natural healing powers of emu oil capsules. Many other remedies for health conditions, such as fatigue and pain, leave people stuck with debilitating side effects that affect their quality of life. Since emu oil is hypoallergenic, this is one of the best natural body care products for people who suffer from allergies and autoimmune disorders. Those who have severely depleted essential fatty acid levels in their body will begin to notice the beneficial effects right away, and the health improvements continue as your body responds to having the supplements it needs to regain healthy functioning. Emu oil can also be used alongside prescribed medications to reduce the side effects of those for a better holistic recovery process. When you are in pain or nutritionally depleted, it shows in your skin, hair, and eyes. With emu oil gel caps, you will slowly notice a transformation in your appearance that occurs through the natural processes of healing generated by the boost that essential fatty acids give to your system. You can use emu oil caps alone, or you can combine them with topical ointments to increase the skin enhancing effects. Watch as your dry skin is restored to a softer, more supple texture. Whether taken internally or applied topically, emu oil is effective for fighting the inflammation that creates wrinkles and allows skin cells to accumulate and cause the plaques that are associated with psoriasis. Better skin, more energy, and relief from discomfort caused by long-term health conditions are all available in the convenience of a tiny emu oil capsule. With no side effects and a hypoallergenic formula, the powerful properties of emu oil are available to everyone, and you can start transforming your lifestyle by choosing to supplement with emu oil today. Over forty thousand years ago the Australian Aborigine settled what is now Australia. The Aborigines used the Emu bird for as a source of clothing, food, jewelry and even the oil as a natural remedy for minor aches and pains. They oil was also used to help heal wounds faster and protect skin from the harsh elements of wind and sun. The use of Emu Oil was most popular in rural areas where it was applied in the treatment of bruised and hypodermic tissue, burns and dry skin problems. Emu Oil consists of three Essential Fatty Acids. Essential Fatty Acids are necessary fats for the body that humans cannot produce on their own, and must be obtained through diet. EFAs have two families: Omega-3 and Omega-6, which are grouped together and then Omega-9. They are considered polyunsaturated fatty acids, which are made up of linolenic, linoleic and oleic acids. The human body utilizes EFA's to reinforce the cardiovascular, reproductive, immune, and nervous systems. EFAs are necessary to the body to manufacture and repair cell membranes, allowing the cells to obtain the highest nutrition and get rid of waste products. EFA's are also utilized in the healthy production of energy. Prostaglandins, which are in charge of important body functions like heart rate, blood pressure, blood clotting and immune function, are produced by EFA's. In addition to its other jobs, children need Essential Fatty Acids for proper growth, particularly for neural development and maturation of sensory systems. Male children can have higher needs than female children, when it comes to EFA's. Unborn children and breast-fed infants require an adequate supply of EFAs through the mother's dietary intake to ensure that proper development will take place. Omega 3's are found within vegetable oil and nuts, like walnuts and flaxseeds. It is often found in animals who have been grass fed. They are a part of the cell wall within plants, making them supple and flexible. ALA can improve circulation and oxygen uptake with proper red blood cell flexibility and function. Omega-3, and particularly ALA, has been found to directly correlate with energy within the body. ALA can also have an impact on reducing some inflammation. Research in this area found that omega-3 fatty acid supplements decrease tenderness in joints, lessen morning stiffness, and allow for people with rheumatoid arthritis to see some relief and increased mobility. LA, or Omega-6, is another EFA. It is considered to be a major part of keeping hair healthy and its presence can prevent dryness and hair loss. In combination with Omega-3, Omega-6 fatty acids help with brain function and assist in normal growth and development. These two EFA's, when combined, are beneficial to the body for stimulating skin and hair growth, maintaining bone health, and regulating a healthy metabolism. Deficiencies in EFA's can lead to reduced growth, a scaly rash called dermatitis, or lack of ability to fight infection and heal wounds. Omega 9 is a monounsaturated fat found within our diets and even in our own bodies in small amounts. Foods like almonds, sunflower oil and olive oil all contain Oleic Acid. It is also found in emu oil, olive oil, olives, avocados, and peanuts. Studies show Monounsaturated oleic acid may help to help boost memory, and assist in reducing blood cholesterol as long as the diet contains a low amount of saturated fats. Vitamin E is a fat-soluble nutrient. It acts as an antioxidant in the body and it can protect cells from the negative and often destructive effects of free radicals. Vitamin E flexes its protective functions as an antioxidant and has roles in anti-inflammatory processes, inhibition of platelet aggregation, and immune enhancement. Red blood cells utilize Vitamin E in their formation and it also enables the body to use Vitamin K, which plays a major role in blood clotting. Vitamin E is added to BLUESPRING Emu Oil to help preserve the freshness and maintain the quality of emu oil. HOW DO I USE PURE EMU OIL GEL CAPS? Adults: As a dietary supplement, three (3) capsules daily for the first bottle, after this take two (2) a day (or as directed by a health care professional). This allows your body to load the essential fatty acids and nutrients you may be depleted in. After that it is important to maintain the balance that you may not be getting from your diet. HOW LONG WILL IT BE BEFORE I FEEL RESULTS? Nutritional supplements work differently for different people. Emu Oil is made up of 3 Essential Fatty Acids. Essential Fatty Acids are necessary in many of the body's daily functions. Essential Fatty Acids cannot be created by the body so it is necessary to obtain Essential Fatty Acids through diet or supplements. It is quite likely that you are depleted in these Essential Fatty Acids and will notice that you feel better in a short period of time. Our bodies are different; it is advised that you stay with the recommended dosage, practice a healthy life style and follow the tips listed on the description tab for maintaining a healthy lifestyle - this will contribute to good health, normal weight and enjoyment of life. WHAT ARE THE SOFT GELCAPS DERIVED FROM? The gelatin used in this product is naturally sourced from beef. It does not contain any sugars, wheat gluten, whey or milk products, artificial colors, or preservatives. DOES PURE EMU OIL CONTAIN SATURATED FATS? Since emu oil is not a vegetable oil, it does contain some naturally occurring saturated fats. An analysis of emu oil shows it contains over 70% unsaturated fatty acids, which is high for a non-vegetable based oil. The major fatty acid found in emu oil is oleic acid (Omega 9), which is monounsaturated. Oleic acid comprises between 40 to 50% of the total fatty acid content. Emu oil also contains both of the two essential fatty acids (EFA's) which are important to human health: linoleic or Omega 6 (10 to 15%) and approx alpha-Linolenic or Omega 3 (1%). Other unsaturated oils make up an additional 5-10% of the oil. IS THERE ANY DIFFERENCE BETWEEN PURE EMU OIL GEL CAPS AND YOUR PURE PRIME EMU OIL? 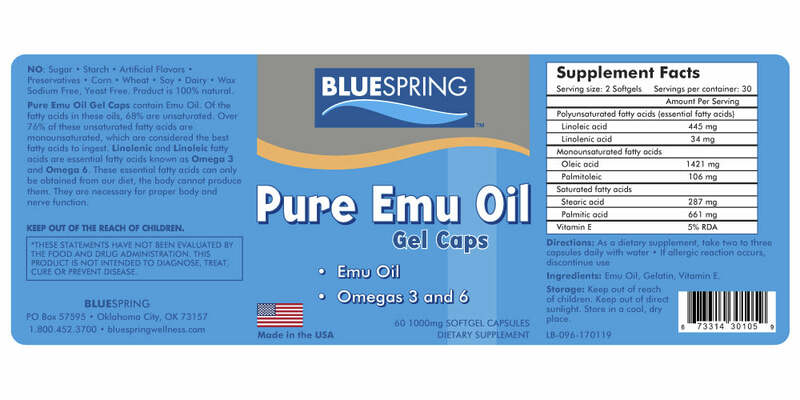 They are both high quality, but only the Pure Emu Oil Gel Caps have been tested to the higher standard for ingestion. HOW LONG WILL MY BOTTLE LAST? Pure Emu Oil Gel Caps contain 60 gel caps. Your first bottle will be consumed at 3 per day - this is for the loading phase. After that you will take two per day for maintenance. At optimal dosage, a bottle will last you 30 days. TELL ME ABOUT NATURAL REMEDY VS. CONVENTIONAL MEDICINE? Pharmaceuticals work by treating your systems. Natural remedies treat your body holistically. The goal is to create a balance that supports total well-being. This results in helping your body work better to relieve what is bothering you now PLUS help prevent future disease. This is why we say there are no negative side effects - only positive side affects! Pure Emu oil alone can help improve the appearance of wrinkles, stretch marks, burns, and scars and damaged skin (this is why we recommend use from the inside and outside).